Seeking Information On Four Fittings- Mino Kinko/goto/kaga Kinko School? I recently acquired these and some other fittings from a private collector who has had these in his private collection for well over 30 years. I was very pleased to acquire them, and some will remain in my personal collection, and some will probably be offered for sale down the road...likely at next year's S.F.Token Kai. 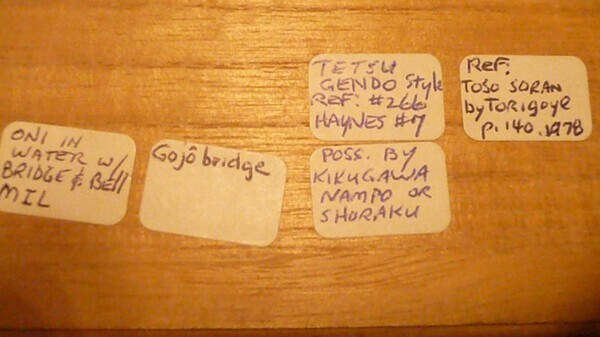 I am hoping to get some help and input from the the more knowledgeable fittings collectors of the NMB, so that I can decide which, if any, of these pieces might justify the expense of submission for shinsa (either in Tampa or in Japan). I do not want to have them papered unless they are of better than average quality, or somehow special, or unless papers are going to make a big difference in the piece's potential market value. Because I have purchased a fairly large group of pieces, at some juncture I will no doubt spin off a few of the pieces to offset the cost of other pieces I plan to keep for myself. I have attached some photos of the fittings, in hopes of getting some initial help and information from those far more knowledgeable than myself. Any information is greatly appreciated. The first is a kozuka with what appears to be a gold persimmon (?) motif, in shakudo and with nanako. In looking on line and at my own limited fittings resources, I am thinking Mino Kinko, but I am wondering if this could possibly be a Goto line piece? 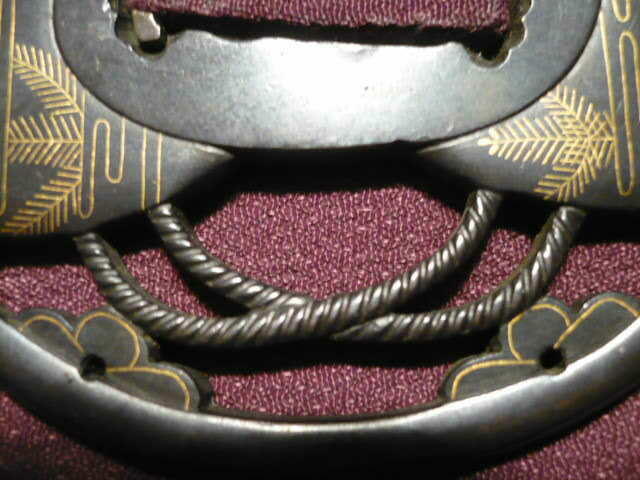 The next is a shakudo and gold inlay tsuba with water and pine needle (?) motif. 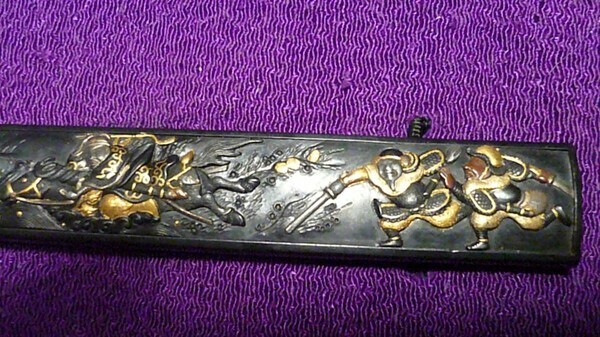 Aoi-Art has one listed on their website that is a very similar piece, but with a different inlay design. http://www.aoijapan....i-kaga. Similarmotif pieces I have seen seem to bring higher than average asking prices on various websites. Aoi-art lists this piece as Kaga Kinko school. Is this part of a Goto school line? 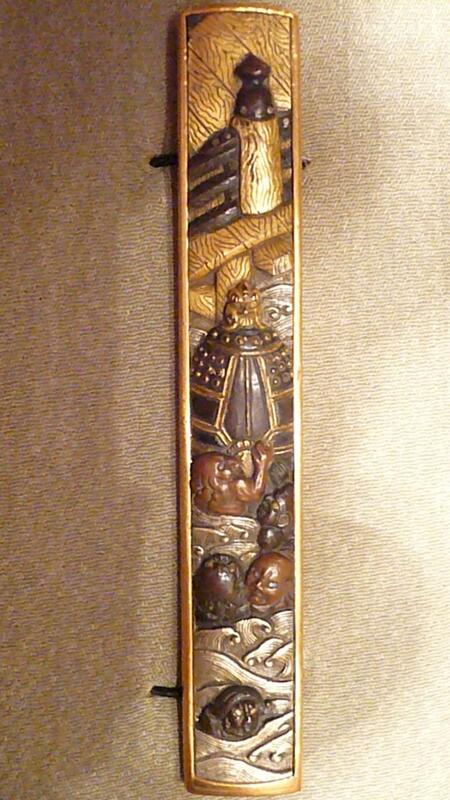 This piece was never mounted, as best I can tell. It is a bit larger than the one on Aoi-art. I am wondering if this might be a good shinsa candidate? 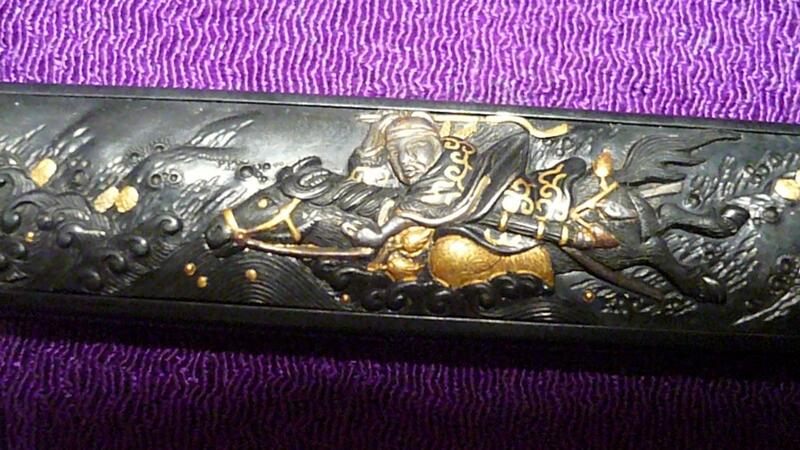 The next is a really nice shakudo kozuka with Chinese Emperor Gentoku being chased through water and escaping some other riders. 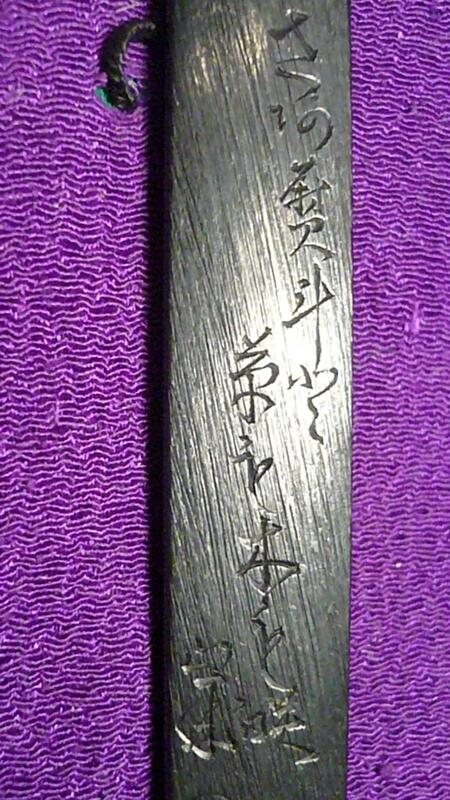 There is writing on the back of the kozuka that I would really like to have translated, if anyone is inclined and can do so. The signature is listed as "Mitsutsugu." 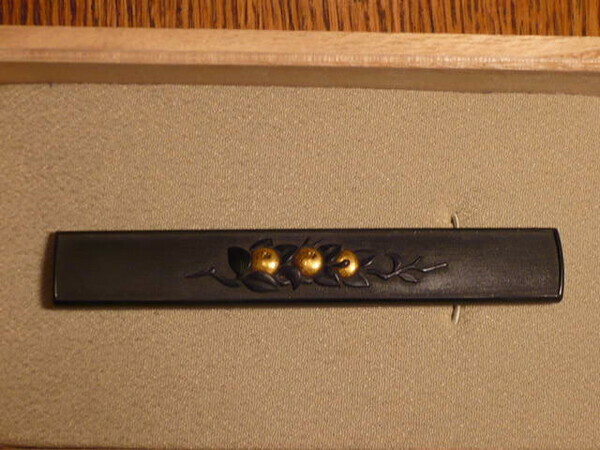 The piece was purchased personally from John Yumoto in 1983. 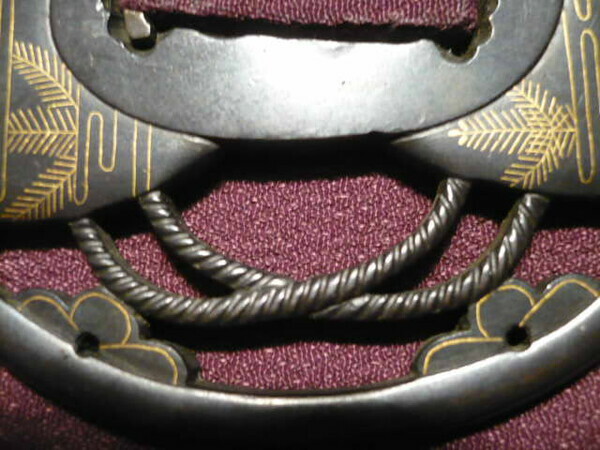 Can anyone tell me what school "Mitsutsugu" was from, and how he ranks as a fittings artist? 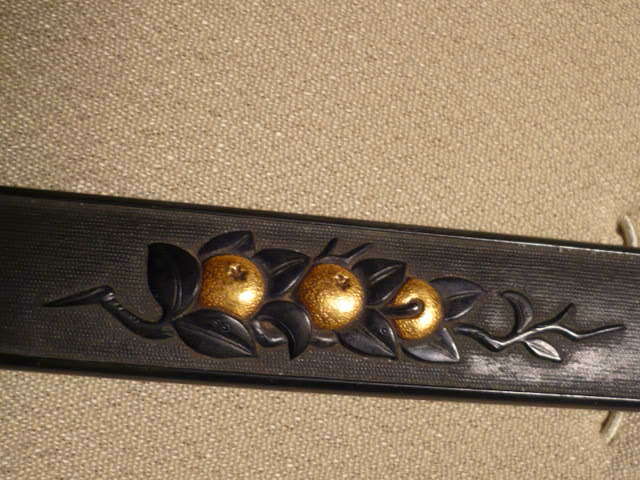 The workmanship on this piece is really above average, in my opinion. 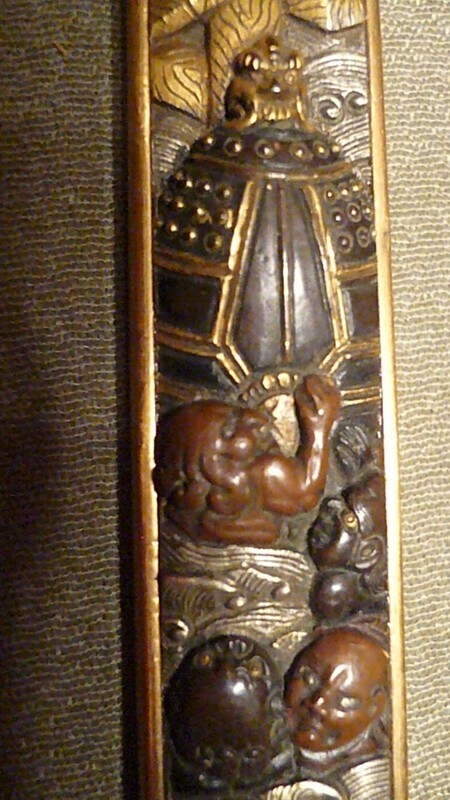 The last is a really incredible kozuka depicting Oni stealing a bell and crossing a river. The relief on the piece is very high and detailed. 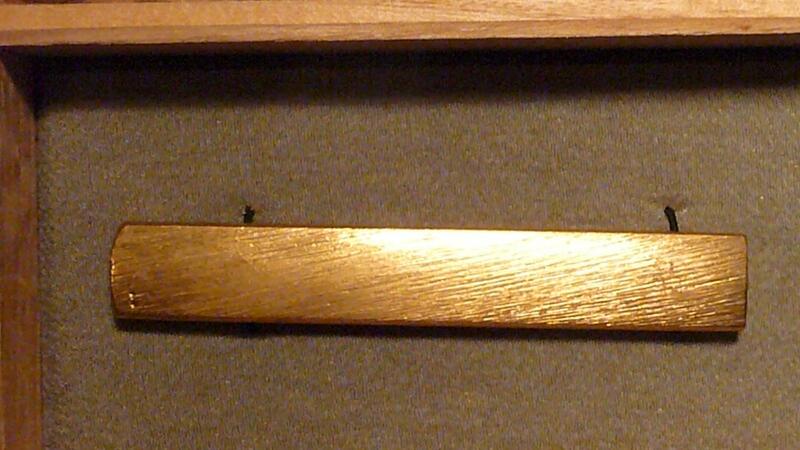 I have not tested it, nor would I, but I cannot tell if the backing is solid gold or gold washed. I have attached a photo of the fitting's box lid with the information the previous owner had obtained. I have no idea what school of fittings artists this piece would be from. Any ideas? If one were to shinsa any of these pieces, any opinions as to which, if any, would most benefit from or justify the expense of a shinsa (NTHK or NBTHK)? 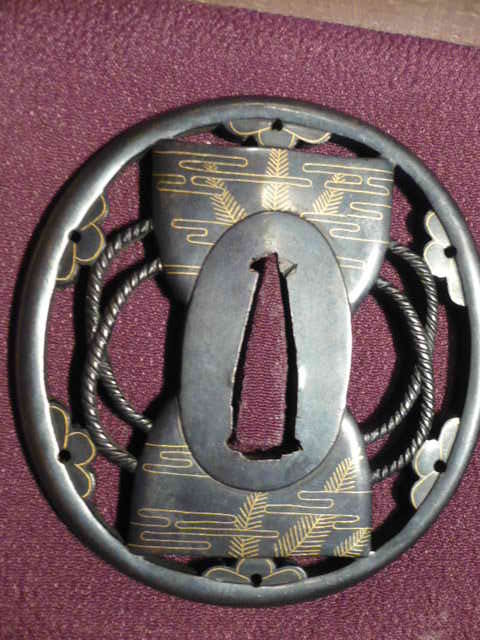 I notice that the Aoi-art link does not connect directly to the similar tsuba listed on his website. His tsuba is listed on page one of his tsuba pages, and is listed as item number F15167. Thanks. Sorry. 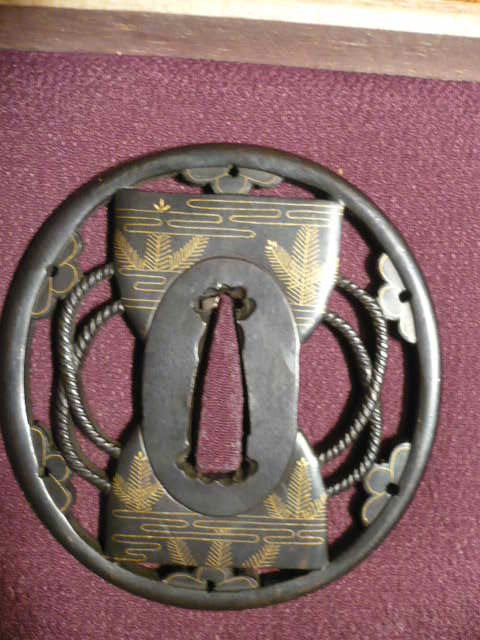 The tsuba item number on Aoi-art is number F15187. I guess it is time for stronger eyeglasses. 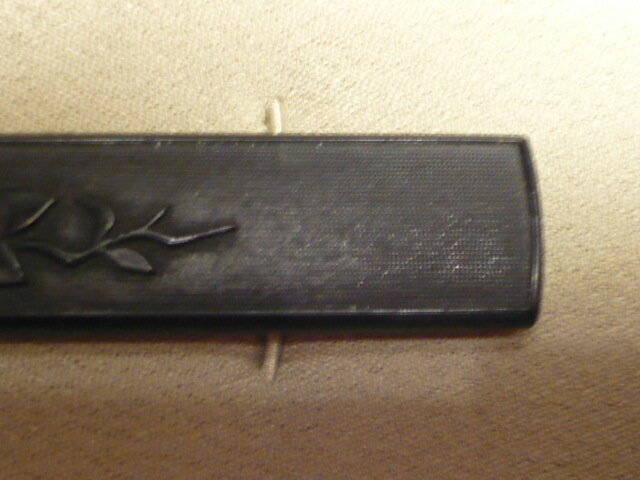 Regarding your 3rd piece (Mitsutsugu); the signature (光次) indeed says Mitsutsugu. I cannot say anything about its authenticity. 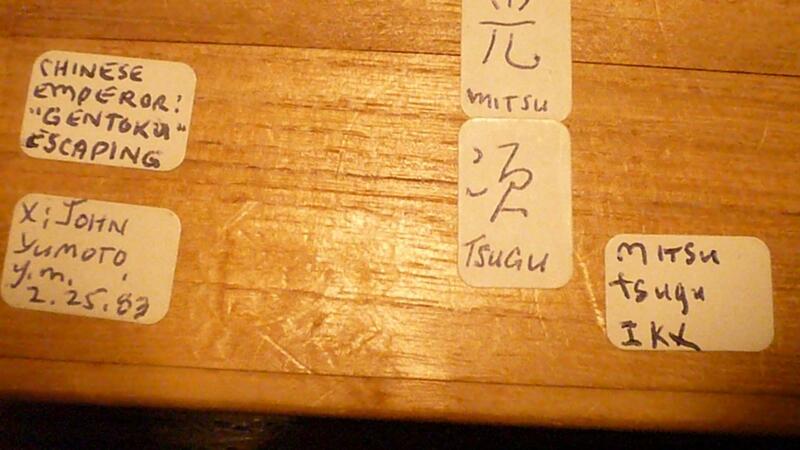 There are at least seven Mitsutsugus according to my reference. The primary MItsutsugu is of the Gotō school, as are some of the Mitsutsugus who followed him. The theme is from the Three Kingdoms saga. Emperor Gentoku (玄徳) is also known as Liu Bei (sometimes spelled Ryūbi when re-translated back into romaji from Japanese), and he appears in Wikipedia under Liu Bei. The episode with the horse is described at the link below. The script next to the signature is too much for me. I can pick out words here and there, but the whole is eluding me. My guess is that its a poem, but that isn't saying a whole lot. 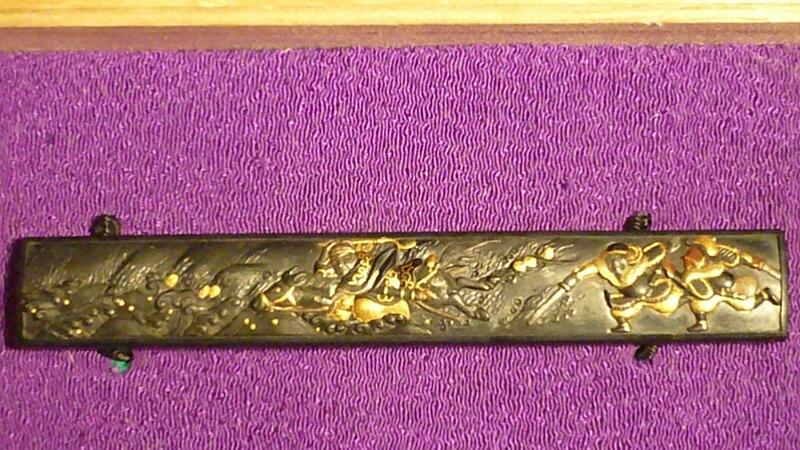 I'd say the one with the oni and the bell is a candidate for shinsa. Trying to find out more about the theme, but it is also proving elusive. I like this one. 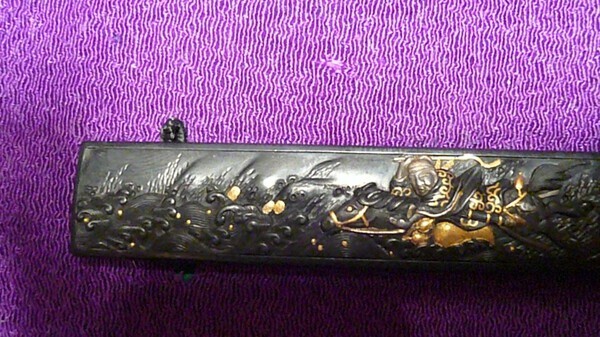 I also like the Mitsutsugu above. I also find the provenance (from John Yumoto) interesting, as his book was my introduction to the sword world, as I suspect it was for most of us here. Wow! Thanks so much for all of the great information. I also really like the Oni and bell motif kozuka as well. I am looking forward to reading the episode you provided via the link. I will definitely consider submitting the Oni piece for shinsa. Thanks again, Steve. 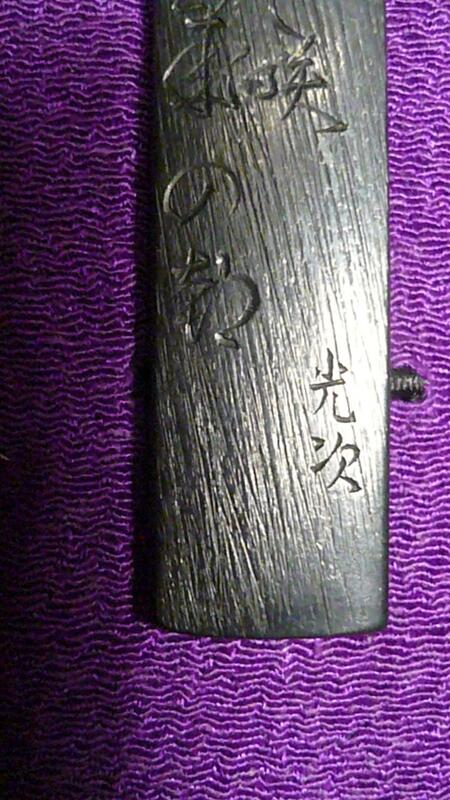 Nobody (Moriyama-san), any chance of you taking a look at the script on the reverse of the Emperor Gentoku kozuka? 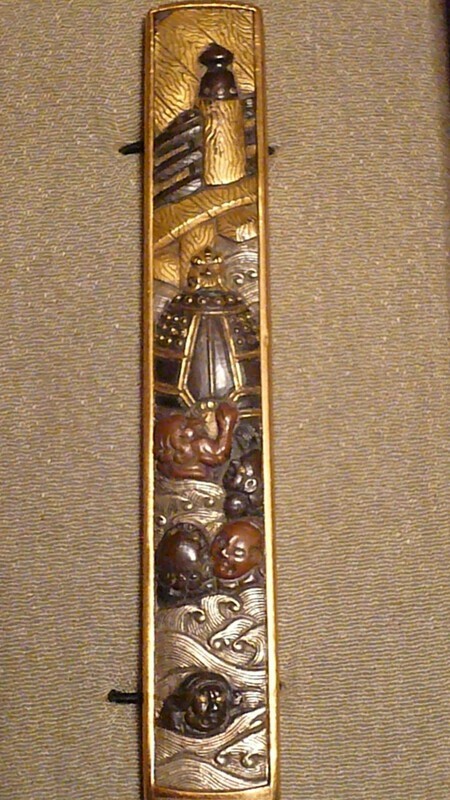 Also, any idea of the theme of Gojōhashi and the Oni with the bell? Is it related to Benkei? 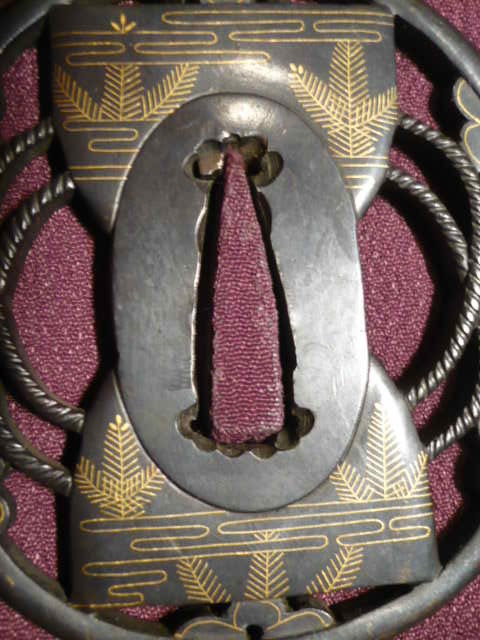 Thanks so much for following up on the translation of the script kanji on the back of the Mitsutsugu kozuka, and the story or theme regarding the Gojohashi and Oni with the bell. I hope Moriyama-san or others can shed some additional light on these two pieces. By the way, I looked at the link you sent me regarding Liu Bei crossing the Tan Stream. Great link! I also checked out the additional information on Wikipedia, like you suggested. 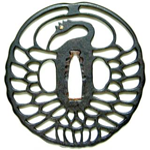 Very informative information on Liu Bei. I appreciate it. Thanks again.